This is another biblicl fiction novel from the author of Journey to The Well, the story of the Samaritan woman who met Jesus at the well. That one was one of the loveliest books I have ever read and touched me deeply. This one did too. Martha is the story of the woman named Martha in the Bible, her sister Mary and her brother Lazarus. It is also the story of their father, Simon the leper and Thomas the apostle, along with a colourful cast of many more characters. But most of all it is the story of Jesus, following closely on many -if not all- the stories depicted in the New Tastement. His friendship with Lazarus, His miracles, His teachings. I loved the book for this. I loved how Jesus was shown, His humanity, His humour, His compassion. 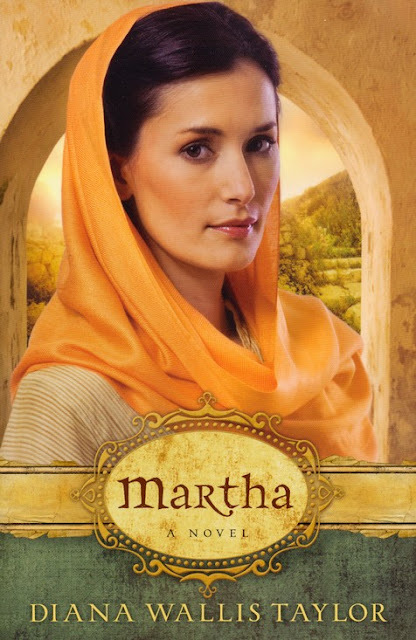 I loved the way Martha's faith in Him developped and became strong as His passion was followed by His resurrection. It was like getting a taste of what it was like to live in the times of Jesus. I often wish I could have been alive then, but I hadn't realized how dangerous it would be for Jesus' followers, since they were trying to kill Him. I also learned a few facts about the period, their customs and their origins, which I mainly liked for their symbolic value. On another note, this book seemed less well-written than the first. There was little or no imagination in the names (all taken from existing characters of the Bible) and their activities. The characters also were pretty one-dimantional and greatly stereotypical. I hate it when that happens in a book, because then I can't feel like they are real peole, it ruins the whole story for me. If the story of the ministry and life of Jesus wasn't closely interwoven with the plot, I probably would have been completely indifferent to this book. But as it was, I am really glad I bought and read it. As with the first book, I don't think I will be reading my Bible the same way after this one, either.